FAQs | KWI Technology Inc.
Can Kingwin ADP-06 work with Dual SATA HDD with the same ribbon? Yes , it can. You need to set up the jumper as shown below. Do not set up both jumpers for each HDD at the same time, only one at a time. For example: For the Master HDD, you would set the jumper to the BLUE setting, but the Slave HDD would be blank. If you would like to set the jumper in Slave HDD, set it up as RED setting but keep the master HDD blank. 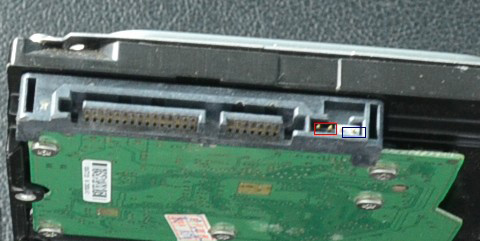 Then you can use the ADP-06 for Dual HDD with the same ribbon to your computer.Red setting is for Slave HDD, Blue is for Master HDD, set up either one, not both at the same time. Do I need to pay for freight cost for defective products send back to you? If you ship the defective items back to us, you must do so freight prepaid. Kingwin will only be responsible for shipping the replacement/parts back to you. Cost of shipping the defective products back to Kingwin will be sole responsibility of the user. How do I return defective units? How long is Kingwin’s Manufacture Warranty? Our MACH 1 and Lazer Series Power Supplies comes with a 3 year warranty. All of our other products comes with a 1 year warranty. However, if the item is within 30 days of purchase, please return to your original retailer or e-tailer. I am an end user, can I buy from Kingwin directly? No, we do not sell directly to end users. But, we have resellers around the world, please visit our Where To Buy section on our website and learn more about our distributors, e-tailers, and retailers. My motherboard is the X7DCA-3-0 made by Super Micro. And we are using the on board Intel RAID ICH9R controller, which is being directly, Can KF-1000-BK support Hot Swap? And my SATA cable has 5cables and yours only 4cables, how to work for that? 1. Kingwin KF-1000-BK can support Hot swap, actually Kingwin SATA Mobile rack all can support Hot Swap.And it depends on Motherboard and Controller card can support or not, if theirs can support, ours can, if cannot support, ours cannot either. Some motherboard support Hot swap by automatically, some motherboard need by manually, some motherboard not even support, please check with motherboard and controller card manual.2. Intel ICH9 controller do not support hot swap, the power cable connector type will not effect this function. Frankly speaking, only the motherboard / HDD/ SATA controller card or IC chip will affect the hot swap function is workable or not.3. The difference between SATA 5pin( 5cables) and 4 pin (4cables) is the 5pin (5cables) had an additional cable for 3.3V, but now for the HDD PCBA design, the 3.3V is not necessary, because the HDD PCBA design could transfer 5V to 3.3V, we use the Molex 4pin and SATA 5Pin with 4cables for a long time, our customer never complain about the 4cables effect any function of HDD activity. Now many power supply design only provide the 4pin (4cables) Molex female power connector or the 15pin SATA female connector, our power cable design is for 12V and 5V and enough or HDD/ SSD operation, you could find the attached file to understand our cable design.